✅ Trip Verified | Food choices really bad. KFC had a a massive queue and didn't stock much choice at all. So I went over to the Mexican restaurant and made an order, then seated at a table; eventually a waitress turned up and asked if I'd ordered - she seemed angry about the fact that my reply was: 'yes I think I have'. 'Did you pay?' 'No, not yet - I was...'. '- then you haven't ordered' - was her interruption, given at such volume most of the customers looked up. I left very quickly to avoid further conflict with an angry, rude waitress. Nowhere else left to eat. Let me out of here asap. 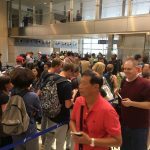 Not Verified | Delta terminal at LAX was overcrowded, dirty and noisy. I felt like it was entering a germy toxic atmosphere. The bathrooms were terrible, people had nowhere to sit, loudspeakers were loud because of crowding. People were getting anxious. I felt there wasn’t enough security or services for handicapped. More help was needed to cleanup! I will avoid going to LAX. Get it together guys! Not Verified | Flew Delta Airlines DTW-LAX 03/22 and LAX-DTW 03/25. Both flights used Terminal 3: Arriving - Landed and to gate within 5 minutes and left airport within 30 minutes (including stop at baggage claim). I consider that a successful journey, so no complaints. Departing - Gate area is totally inadequate for the number of flights arriving/departing. I would say there's seating for roughly 1/4 of passengers, with most standing wherever possible. In addition, the eating options are very limited. It was an unpleasant two hours. However, I will say that TSA Pre-check took less than five minutes and everyone we encountered was courteous. "crowded, dirty and poorly planned"
Not Verified | We are elderly and I use a cane. I have been diagnosed with severe degenerative disk disease and cannot walk very far at a time. We set out from a domestic terminal at one end of the airport to the international terminal. We had our suitcases in a cart and kept asking employees which way to go. When we reached the end of the building, I asked a group of chatting employees how to reach the international terminal for our flight to Singapore. The female of the group said to go outside and walk about ten minutes and we would be there. She could see my cane, there is no doubt we are elderly and that my husband was pushing a large cart of four suitcases. I asked if that was the only way since it was raining outside and she smiled and said yes. She gave us no indication that there are shuttle buses for travelers so we started walking. It might be 10 minutes for a young person, but it took us at least 30 minutes. Time was not a problem, exhaustion was. We finally made it to the international terminal where there are very few seats...maybe one per 50 passengers. Our airline counter was not yet open so we stood and waited as seats became available. After a couple of hours, I needed to find a restroom which was a very long walk from where we were. No seats and no restrooms. Once we checked in, we were told that it was a very long way to our gate. That was an understatement. Our airline, Singapore Airlines, was the last gate at the farthest end of that terminal. We walked and rested and walked and rested. We were passed up by many carts carrying people. How are you supposed to get a cart? I had asked before we flew if we could get them and was told you just had to happen upon them. We never did, but others sure did. Later I realized that many people waited at the plane upon exiting and the carts were brought to them yet I was told this could not be done for us. The capper to all of this was when we were finally allowed to board, we were taken out into the rain and very strong wind to a bus, from the bus, we climbed stairs onto our plane. I felt like I was back in primitive 1970s Iran. Upon our return, we had a very tight connection and had to get from the international terminal to a domestic terminal. The first employee I saw when we deplaned was a nice man who handed us two orange express connection passes. We took those and rushed for our baggage so we could go thru customs before boarding a domestic flight. We thought those passes would help, but they served no purpose whatsoever. We went to the back of the line just like everyone else. They would have signs directing us to the express connection lines, but they were no faster than regular lines. At least this time I found a kind employee who told us there were shuttle buses we could take to the domestic terminal. That was very helpful, but we rushed as fast as we could and were told there was no way we could make our flight. We will never go thru LAX again. Why no help for disabled travelers? Why do you have to go outside to another terminal? Visit Changi airport in Singapore to see a truly amazing airport. They have lounges you can sleep on, free foot massage machines, clean restrooms, lots of seating, helpful employees and even a nature walk. Even the tiny airport in Dunedin, NZ, is better organized and cleaner than LAX. 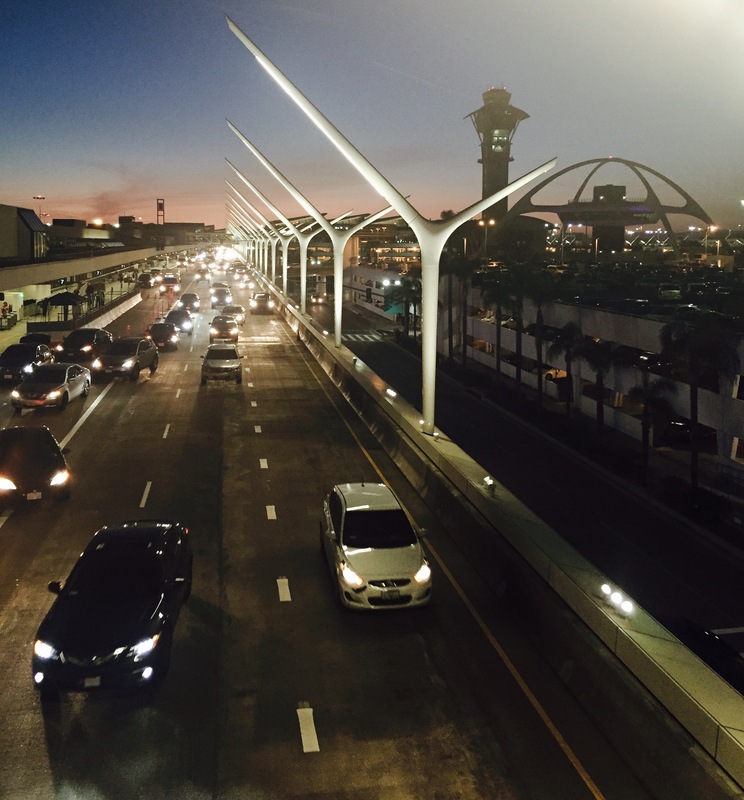 LAX is crowded, dirty and poorly planned. I consider it the slum of airports and I've seen some pretty pathetic ones in the Middle East. "Staff were extremely unhelpful and rude"
Not Verified | Worst airport ever. Staff were extremely unhelpful and rude. 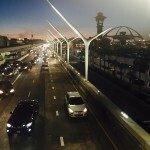 My wife missed her connecting flight because of tarmac delays when she landed, and was a nightmare to change her flight. 2 different people working for the airline shrugged and didn't know what to say when she asked how to go about getting on another flight. She didn't know her way around LAX very well and when asking employees of the airport and airlines, they acted like they didn't have time for her. I will never fly to this airport again. John Wayne will be where I go, even if it is out of my way. 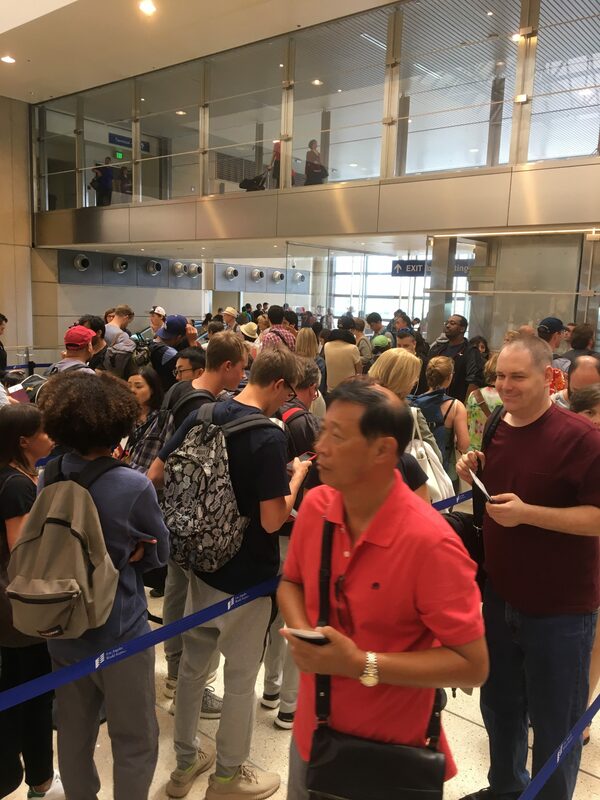 If you plan on flying to LAX and have a connecting flight, good luck. "really easy and very accessible"
✅ Trip Verified | The airport is located in a great location which makes it close to everything. The check in is really easy and very accessible. The security might take a little while. Inside the airport is really nice with plenty of stores and restaurants. Of course everything is quite expensive but as in other airport. ✅ Trip Verified | Terrible airport! The assistant staffs at the immigration Zone who dress in red are rude! All the staffs including the immigration officer work terribly slow, it had been like that for so many years but never ever tried to improve. Definitely not a city that welcome the tourists to visit! I wouldn’t choose it as my transit stop in the future! Or else you just prepare to wait for 1.5 hours to 2.5 hours just to get through the immigration, bearing with their bad attitude. "we deserve to be treated better"
✅ Trip Verified | The airport lady personnel at the exit after baggage claim was very rude. It was not busy when we arrived Feb 5, 2019, 7:30am so after almost 25 hours travel time we were walking slowly and she said "move faster, what are you afraid of?". Then the male personnel at the customs was also rude when he pointed us to the secondary inspection. He said "go to letter a, don’t you know letter aaaaaaa?" We are Filipino American professional friends who vacationed together and we are slower but not dumb. We understand the letter a. We were treated way better in other international airports and to be treated this way by our fellow Americans is just unacceptable. The screening of our bags did not produce any "banned items" like they "expected" coming from the Philippines. We came from Incheon airport and I accidentally forgot to eat a fully wrapped individual banana and the male personnel made it appear a intentionally committed "crime". He asked for my passport back and obviously typed something on the computer. When I asked what’s with the passport, he said "what we do with your passport is none of your business". What a rude response. There should be a major overhaul of airport personnnel training in customer service and emphasize that we pay for airport services and indirectly their salaries and we deserve to be treated better. Not Verified | Rudest employees of any company I have ever met in all my years. I've had interactions with over 20 airport employee's (TSA, food service, others) and haven't heard the words please or thank all day. All employees have a staring problem. If you ask an employee for help of anykind be ready to receive the wrong directions and be ready to figure out the problem for yourself. Avoid this awful place at all costs. "has got to be the worst terminal"
Not Verified | Terminal 4, 01 Feb 2019. This has got to be the worst terminal I have ever been through. Very frequent business traveler. Poor seating. Poor food choices. And one, yes one (1) working restroom from gates 40 to 49. The terminal is packed. Tempers are getting heated. The data signal here is non-existent, a slow wifi is your only connectivity. This the best you can do LAX? You should be ashamed!